Dystopian is the name of the game right now, with multiple offerings to choose from. Though there are a number of copycats cropping up, there are still some new, great reads fans of this genre might enjoy. “Dark Parties,” by Sara Grant, is one such novel. In fact, it might be one of the more surprising reads of the year. Neva is 16-years-old and by all accounts now an adult. She’s expected to do her part and conform to the rules of the Protectosphere — the dome under which she has lived her entire life. Truth is, Neva has been trapped since the day she was born. Her nation is one that is ruled by fear — fear of the past, fear of the present and fear of the unknown. The dome protects the nation’s people from the outside world, but it also keeps them locked inside. There’s nothing left of the world outside, nothing since violent warfare forced the world to collapse. At least that’s what the government says, but Neva isn’t so sure about that anymore. Along with her best friend, Sanna, Neva stages a “dark party,” a party that literally takes place in the dark, to recruit people to rebel against the government. The deeper Neva gets involved, the crazier things turn out to be. But it’s not just Neva’s life at risk anymore, her decisions could destroy those she loves the most. Like all dystopian novels, the theme in “Dark Parties” is that of a future in which things are the opposite of Utopia, unhappy and typically totalitarian. 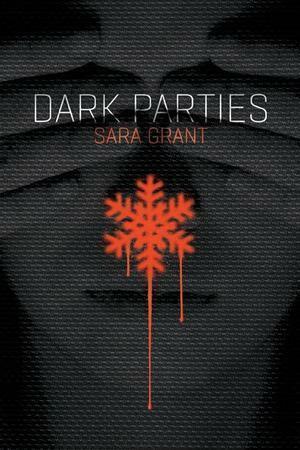 What sets “Dark Parties” apart is author Sara Grant’s characters and the places she takes them. Like its title, there are elements of this novel that are very dark. But they feel necessary in helping Grant’s protagonist and her readers see the light. There are varying shades of grey here and its different degrees are interesting and complex. Grant gives readers little gifts with each of her plot twists, many of which are not visible until they hit you in the face. And while I can’t wait to read more by this author, it’s nice to have a story contained in one book. This is one book readers will want to revisit more than once. © 2011 – 2013, Cracking the Cover. All rights reserved.